While I was in California, in between working and visiting with my family, I did have some time to visit a two other quilt shops. Southern California has more than their fair share of really good ones! Look at my last blog post to see all that Fat Quarters Quilt Shop in Vista has to offer. Me, Lisa Bongean and my A Primitive Gathering BOM quilt in the background. I popped in at Primitive Gatherings in Murrieta and found Lisa in the shop while I was there. She was on her way out to teach for a guild, but we had a few minutes to catch up and visit. This Primitive Gatherings shop is not even a year old, and look how chock full of yummy goods and inspiration awaits. You can sure linger there a long time to take it all in. Sometimes, I'm hit with a kind of sadness when shopping at a store like this, only because you are met with a strong desire to make everything you see, and you realize you only have but one life and just can't have it all. What a bummer! Teehee!! I was so jazzed to see this display of my patterns. They have lots and lots of other designers, too. So, so much to choose from. This is another 'must see' quilt shop if you're in the Temecula, CA area. Keep up with what's new at Primitive Gatherings blog and Lisa Bongean's Blog. by Pam Buda for Marcus Fabrics. The next day, I headed to Temecula to visit with Sheryl at her shop, Temecula Quilt Co. I was very happy to see that my new fabric, Old Green Calicos was in the shop when I arrived. Last year, Sheryl created this awesome Prairie Burgoyne quilt using my Prairie Gathering fabric line. Love, love this quilt, especially because of the way Sheryl added her name to the top of the quilt. So vintage repro!! When I was there last year, I saw the quilt in progress, and was very happy for the opportunity to see it complete this year. Temecula Quilt Co. features tons and tons of Civil War reproduction fabrics. I think you would agree that Sheryl has a wonderful way of displaying the fabrics and quilts in the shop. Keep up with what's new at Temecula Quilt Co. on Sheryl's blog as there's always new and inspiring projects waiting for you. Next week, I'll be visiting the Country Road Quilters Guild in Ocala, FL for a lecture and workshop. The workshop is filled, but you can still come to the lecture on Feb 4th. Email Karen at kah577@aol.com. Next month, I'll be at The Indiana Heritage Quilt Show March 3-5th, in Bloomington, IN. Click here for more info on the show. There will be more new things to tell you about from Heartspun Quilts in my next post. Until then, hope you find some time for stitchin'!! Labels: A Prairie Gathering, Old Green Calicos, Pam's Fabric with Marcus Brothers, Primitive Gatherings Quilt Shop, Temecula Quilt Co.
Fun To Go, Good To Be Back Home! As you may know, I took a little trip to southern California a couple of weeks ago. Had a wonderful opportunity to visit with two guilds in the San Diego area, visit Fat Quarters Quilt Shop, and spend some vacation time catching up with my dear aunt and cousins that live near there as well. Just got home and back to C O L D weather. Brrr! First stop was with the Friendship Quilters Guild of San Diego. I gave a lecture to their members and the next day, was lucky to spend time with this great group in my Practice What I Preach workshop. And, yes! Your eyes do not deceive you...that's Ed kneeling on the floor , and he's really a terrific piecer, and if memory serves, long-arm quilter! What a great group! We had a lot of fun. Next, I gave a lecture and my Settler's Puzzle workshop for the wonderful people of Sunshine Quilters Guild of San Diego. Now, I have to confess that I don't have a photo of them. I can honestly say I was having such a good time that I plum forgot to take a photo. I feel terrible about that, and hope they all forgive me. I'm not all that good at remembering to take pictures for the blog and Instagram/Facebook...I'd honestly rather just be "present" in the moment, but must try to do better! Lastly, I spent the day at Fat Quarters Quilt Shop in Vista, CA, with this lovely lady, shop owner Michelle Joyner. Michelle and I have known each other quite awhile now as we met the same year at quilt market. It was her first year as a shop owner and my first year exhibiting. Fat Quarters truly has everything and something for everyone! Notice the wonderful tree quilt hanging on the wall, and behind Michelle in the previous photo? Michelle designed that quilt for publication in Primitive Quilts and Projects magazine and it graced the cover! Congrats, Michelle! Maybe she still has a kit left for you?! As you can see...inspiration, inspiration everywhere! To say the least, Fat Quarters is a full service quilt shop in every way. 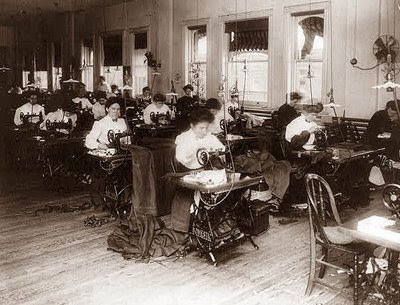 There are bolts and bolts and bolts of fabrics in many genres. No surprise I was drawn to the Civil War repro section, and perused her wool selection, too! If you're in the southern California area, don't miss a stop to Fat Quarters in Vista. Tell Michelle I sent ya! A big, giant THANK YOU to all the members of both Friendship and Sunshine Quilters Guilds of San Diego, and of course to Michelle at Fat Quarters for inviting me to visit and teach. I do so love to travel, meet quilters and spend the day sewing and chatting about our favorite past time! I had great fun. I'm headed west to the San Diego area for a series of lectures and workshops. I won't be blogging until I return to my office on the 24th. I will be posting here and there on Instagram and Facebook, so you might like to visit me there. How can I possibly go to So Cal and not visit my favorite quilt shops, right? So, I'll try to post some photos from the guild visits, quilts shops, and this will also be my first time attending the Road to California Quilt Show!! I think I'll have some time for hand sewing while waiting in the airports, and in the evenings while visiting with my family. Hope you find some stitching time, too! Old Mill Pond Is Ready!! I'm just delighted to finally be able to introduce you to one of two new quilt designs featuring my newest fabric collection, Old Green Calicos, for Marcus Fabrics, called Old Mill Pond. When I designed this collection, I was in a mood for peaceful, restful and comforting fabrics in cozy colors. The living room in my home is all done in soft greens and blues, and is a favorite place for me to read and stitch. The walls are a warm beige with old fashioned stencils, and the lighting is very soft. Inspiration struck and Old Green Calicos came to be. Prairie life always inspires me, and when the early settlers sought to homestead, receiving a land parcel near water was, of course, a prize for many reasons. Thinking those thoughts, and about the blue and green colors, a picture like this came to mind. Can you see yourself in a comfy chair gazing at this scene? I sure could. 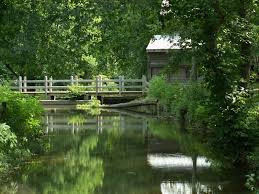 The colors and serenity inspired the name for the quilt....Old Mill Pond. In a previous post, I showed you photos of the gorgeous quilting on this quilt, by Valerie Langue. Now that the quilt is done, and photographed, the patterns are ready to go. As I've done before, I'm offering a kit at a special discounted price for a limited time. By pre-ordering, you can be assured of having all of the original fabrics in your quilt, available as soon as they arrive. The quilt will be exactly like mine! Along with the pre-order is special pricing, with a discount on shipping, and FREE PATTERN! 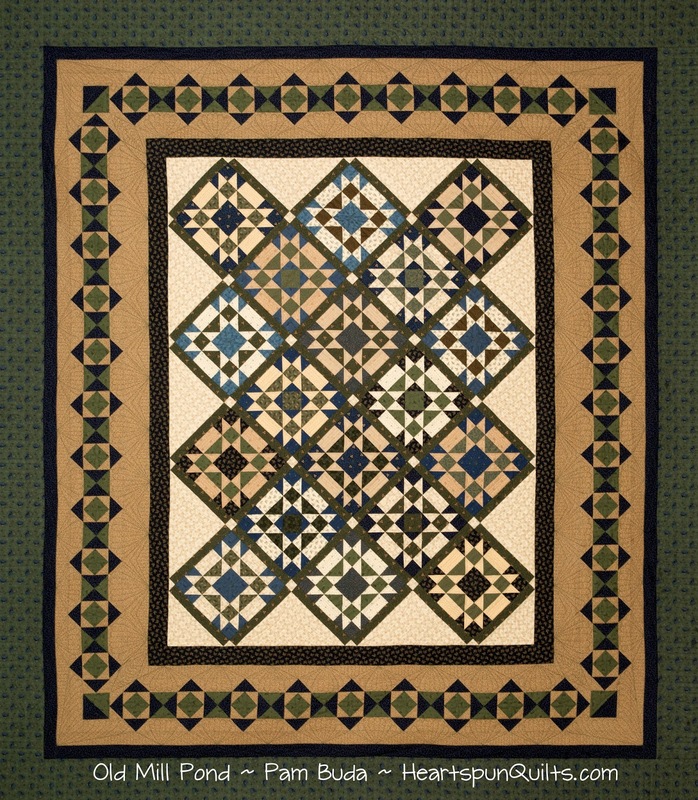 Pre-Order your Old Mill Pond quilt kit no later than January 29th to take advantage of this special offer!! Click here to read all of the details and place an order. The kit and pattern will ship in early February, just as soon as the fabrics arrive. Click here to order the Old Mill Pond pattern. My Old Green Calicos fabric collections are arriving soon at your local quilt shop, so please ask for them on your next visit!! I'm starting the New Year with a bang. My family and I so enjoyed our relaxing time over the holidays, and when the calendar turned the page, we all went back to being busy. You, too? For several days now, I've packed lots and lots of boxes all headed out to the San Diego area for next week's events. Now that my UPS guy has picked them up, it's time to take care of some normal business, and start packing for warmer weather! Yippee! Here's where I'll be in the next few weeks just in case you're interested in attending. I'd sure love to meet you!!! I have lots of new stuff coming soon, with two new patterns releasing later this week and next week. I'm working on a new BOM that I know you're gonna love and multiple new fabric lines to keep your stash happy. I've been loving stitching on a few wool projects in the evening...new things to display in our home. Did some stitching while thoroughly enjoying last nights episode of Downton Abbey. Wasn't it grand?! I just can't figure out why such a popular show is ending after only 6 seasons?? Hope you, too, find some time to feed your soul with the stitches you sew!